Here are 6 ways to engage your clients in your upcoming sales presentation. I write this article as a manager who has spent over a decade evaluating vendors and suppliers on a regular basis. I also write this as a professional presentation consultant who has been helping companies pitch better for the last 1 year+. B2B sales presentation is a high-stakes presentation where usually the first meeting seals your fate. Either you impress your client or you don't. Here are 6 tips to help you engage them better. Click on the infographic for a better view. It contains the summary of this article. Open your sales presentation right now. Think about the last time you presented this to a prospective client. How much time did you speak for? 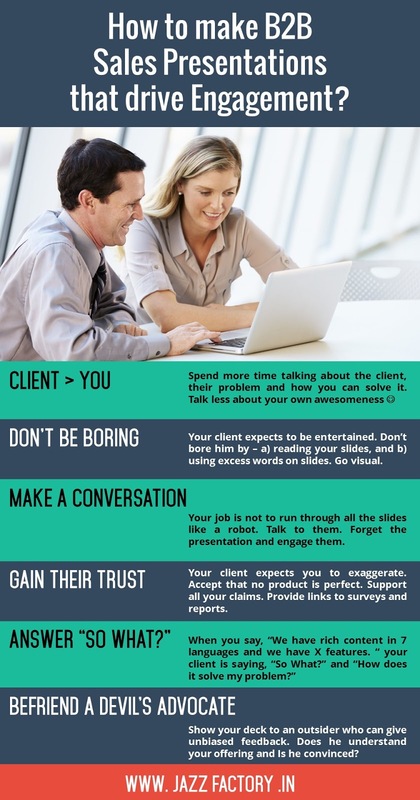 Out of this, how much time was spent talking about your company and how much time was spent talking about the client - their problems and your solutions to their problems. Recently I saw a sales deck of a large multi-national company which sells a service to clients across the globe. This B2B sales presentation started with the usual - about the company and how great is the service. Out of the 20 minutes, the first 10 was spent talking about the service and how cool it is. This is not the right way. Because - YOUR CLIENTS DON'T CARE. They do not care how great your company is and how great your product is. They care about themselves and how your service can help them solve their problems. So what should you talk about? B2B sales presentations are often boring. Go back to your own sales deck. Does it have lots of visuals or does it have lots of text? Are you sharing a video or sharing a case study? Most B2B sales presentations are made by the sales person to the client. Since you (the presenter) is doing all the talking, you must use the slides as an aid and keep the words on every slide to a minimum. What happens when you use more images and very less text, you become more entertaining. No one wants to read every word on the slides. Don't make it difficult for your client. Don't make it boring. Your job is not to run through your sales deck as fast as possible. You do not have to do it - because it is your job. Your ultimate objective is to get the client excited about your product or service and give you a second meeting. So make a conversation. Do not look at the slides while you talk. Look at the client. Talk to them. Use the slides to support a point or to clarify something. Be prepared to switch off the slides for a moment (PRESS B or W in slideshow mode) and continue talking. As soon as the slides are off, even for a moment, the entire focus shifts from the slides to you. Make use of this extra attention and talk. All B2B sales presentations start in the same manner. You want to sell to your clients. So you will speak great things about your service. You will never tell the prospect that your product is not the best. And your clients know that. Your clients expect you to 'sell' to them. They expect you to exaggerate. In a situation like this, where you are starting from a place where trust is low - what should you do? Your client does not trust you, to start with. You need to win their trust. Make sure you support every claim you make. Accept some drawbacks which your product has. Your client is not looking for the best solution, so stop selling them one. Sales presentations are full of features, features and more features. They are full of facts, facts and more facts about your product. Put yourself in the shoes of the client and ask, so what? What does feature A mean to the client? Why should they care? Having figured this out, now communicate the benefit to the client. Your job is to tell the client how your service solves their problems. So talk about benefits to the client. No presentation is perfect and your aim should not be to deliver one either. But your presentation has lots of scope to improve. Is the product offering clear? Do they understand my USP? Do they realize we understand them and their problems? If you have these doubts, it is best to consult your friend or an outsider who knows little about your company and its offering. Pitch the deck to this 'devil's advocate' and instruct him / her to find loopholes. Ask him / her to challenge you and ask you difficult questions. This is the best way to fine tune your sales pitch and prepare to face more clients.